Ashley Baran is this month’s FIT Sports Performance Athlete of the Month! What is your proudest moment/biggest accomplishment since you started? My proudest moment since I started at FIT is when I achieved my goal to do more pull-ups. What do you like most about being a FIT member and Sports Performance Athlete? What I like about being a FIT member is it makes me feel more confident about myself. What are you still working on to achieve? I am still looking to achieve faster and more powerful lateral movement. Tell us one random fact about yourself that has nothing to do with sports? I like to surf! What is your favorite workout? My favorite workout is anything with core. What is your favorite athlete? My favorite athlete is Tobin Heath. What is your goal in life? My goal in life is to go to college at North Carolina and play soccer. 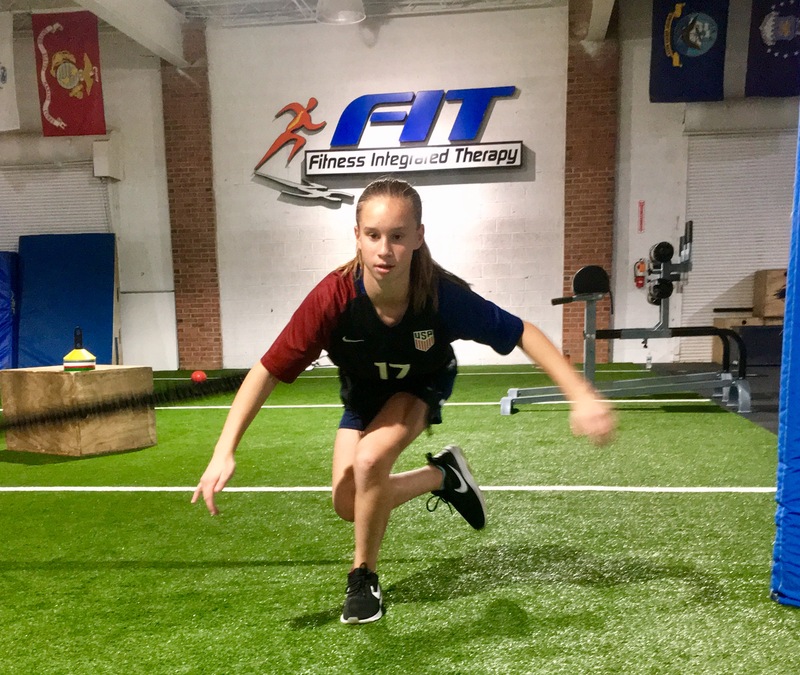 Ashley has been working very hard with our FIT Sports Performance Coach, Coach Bill since October of 2016 and has made great strides in such a short amount of time. Keep up the great work Ashley! Patrick Nowak is this month’s FIT Sports Performance Athlete of the Month. A dedicated soccer, baseball and street hockey athlete, Patrick has been training hard with FIT Sports Performance Director, Coach Dan. With a personal goal to climb the rope all the way to the top, Patrick has been steadily increasing his speed and exemplifying a marked improvement in balance and strength. His favorite workout is anything involving running. In his spare time, Patrick enjoys building with Legos and playing board games. Patrick’s role model is Clint Dempsey and his life’s aspiration is to become a better soccer player. Congratulations, Patrick, and keep up the excellent work! What is your proudest moment/biggest accomplishment since you started? I am quicker on my feet, which allows me to stay with my man on defense. What do you like most about being a FIT member and Sports Performance Athlete? I like how my coaches relate my exercises to situations I might come across in basketball or in other sports. What are you still working on to achieve? I am working on being able to jump higher so that I can dunk! Tell us one random fact about yourself that has nothing to do with sports. I love to eat pizza! What is your favorite workout? My favorite workout is when we do cardio and core. What is your goal in life? To be in the NBA.